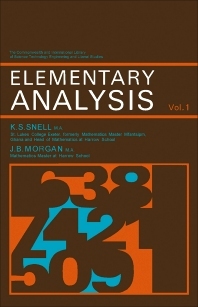 Elementary Analysis, Volume 1 introduces the reader to elementary analysis in an informal manner and provides the practical experience in algebraic and analytic operations to lay a sound foundation of basic skills. The preliminary ideas are illustrated by applications to the simpler algebraic functions. Emphasis is on fundamental principles, rather than manipulative techniques. This volume is comprised of 14 chapters and begins with a discussion on number systems, covering concepts ranging from number scales to rational and real numbers, binary operations, and deductive methods. The following chapters deal with sets, vectors and congruences, and functions. Exponential and logarithmic functions, the straight line, and linear function are also considered. The remaining chapters focus on the quadratic function; the principle of mathematical induction and its applications; differentiation and the inverse process; and integration and its applications. Differential equations are presented, along with the definite integral. This book will be of particular value to teachers and students in training colleges.